Transform the humble egg into a cracking meal. 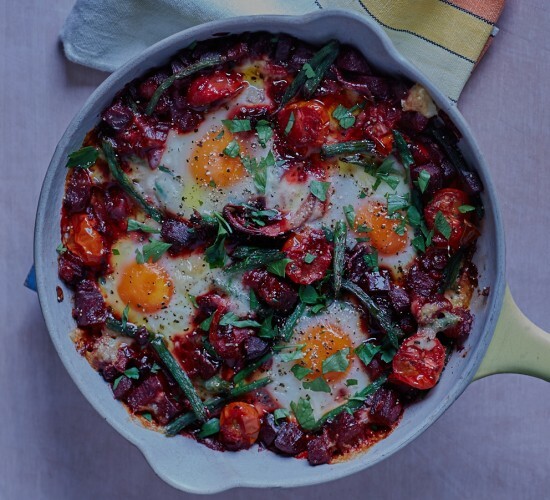 These baked eggs with tomato, beetroot, green beans and Taleggio are perfect for breakfast, lunch or dinner! Preheat the oven to 190°C/375°F/gas mark 5. Heat the oil in a large ovenproof pan over a medium heat and add in the red onion and sauté for a few minutes until soft. Add the garlic and beetroot and stir everything together. Add the cherry tomatoes and cook for a further six or so minutes until the beetroot is starting to soften. Season. Blanch the green beans in salted boiling water for two minutes until they’re bright green. Drain and stir into the pan along with the Swiss chard. Make four little wells in the mixture and crack in four eggs (an egg per hole). Sprinkle over some paprika, salt and pepper. Add a few pieces of Taleggio cheese around the mixture and pop in the oven for seven to ten minutes until the whites have set and the yolks are still runny (to your taste). Finish by sprinkling with the parsley and drizzling with olive oil. Serve with crusty bread.